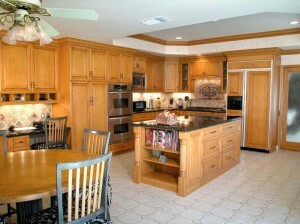 Kitchen islands are ideal for growing families, gourmet cooks, people who love to entertain, and everybody in between. There’s just something about having a permanent flat surface in the middle of your kitchen that seems to make the perfect place for breakfast in the morning, reading the mail upon returning home from work, and gathering with friends in the evening. Plus, the right kitchen islands can bring the entire room together, acting as the single focal point. And when you are looking for a company you can trust to install a new kitchen island, there’s none better than the professionals at Reborn Remodeling Solutions. As a full-service home remodeling company that’s licensed, bonded, and insured for work kitchen-islands-for-residents-of-southern-california in California, Reborn Remodeling Solutions knows what it takes and has the skills necessary to provide you and your family with The Ultimate Remodeling Experience®. To us, that means going beyond just kitchen islands and updating your entire kitchen to your exact specifications. It means putting the care into your home that we would for our own home. If you care to learn more about the kitchen islands that Reborn Remodeling Solutions can add to your home, please call us at 1-877-371-4943 or come visit us at our 40,000-square-foot showroom and manufacturing facility at 2981 E. La Palma Ave. in Anaheim today. We proudly provide our kitchen remodeling services to homeowners in Fountain Valley, Huntington Beach, Yorba Linda, Mission Viejo, Santa Ana, Los Angeles, Placentia, Laguna Niguel, Brea, other Orange County communities, and all across the Southern California area. "Eddie D did a great job. I love my REBORN kitchen. "